Today Antutu reveals our list of the global top 10 best performance smartphones for September 2018. What are the best Android phones on the market right now? Check out our top 10 list as measured by the average Antutu score. 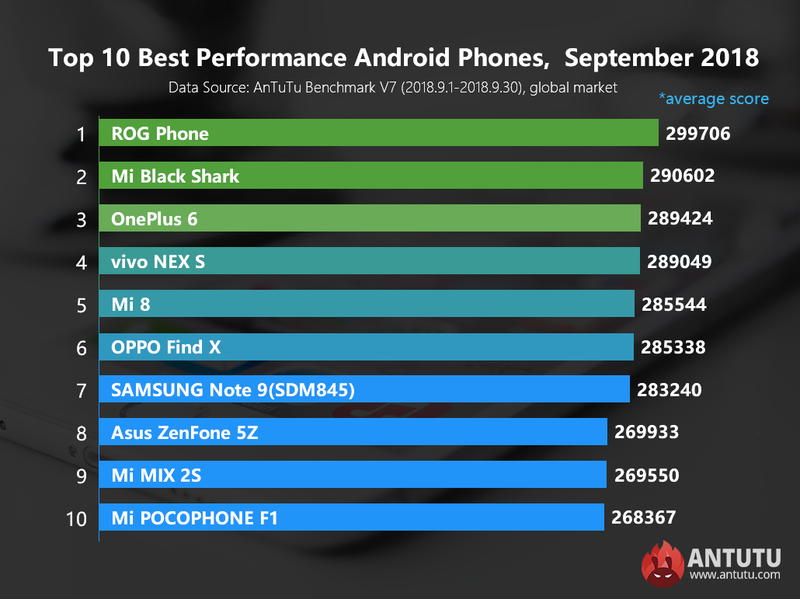 According to our most updated September ranking, the newly launched Asus ROG phone managed to overtake Mi Black Shark gaming phone as the best performance Android phone with an average Antutu score of 299,706 points. Officially, ROG phone is powered by the custom version of Snapdragon 845 processor clocked at up to 2.96 GHz that allows it to deliver better performance than the normal Snapdragon 845, plus the excellent cooling system, its first place on the list is well deserved. Mi Black Shark gaming phone slipped to the second place this month with an average Antutu score of 290,602 points. Equipped with the normal Snapdragon 845 processor, Mi Black Shark also has an excellent liquid cooling system that helps it dissipate heat better than other devices with similar specs, allowing it to be more stable when running with high frequency and therefore score higher in benchmarks. OnePlus 6 comes in third with an average Antutu score of 289,424 points. The Snapdragon 845 processor plus 8 GB of RAM, along with good system optimization laid solid foundation for its strong performance, justifying its place on the list. The rest of the list are as follows: vivo NEX S, Xiaomi Mi 8, OPPO Find X, the Snapdragon 845-powered Galaxy Note 9, Asus ZenFone 5Z, Xiaomi Mi MIX 2s, and Xiaomi Mi POCOPHONE F1. In general, this month’s top ten rankings are dominated by smartphones powered by Qualcomm’s Snapdragon 845 processor once again. In October, with the release of Huawei Mate 20 series powered by Kirin 980 processor, we expect to see changes to the ranking list in the next few months. The above data reflects the changes of Android phone performance for September, 2018. For more information about the ranking list, please visit Antutu official website or download AnTuTu Benchmark and check in the menu of “Ranking”.